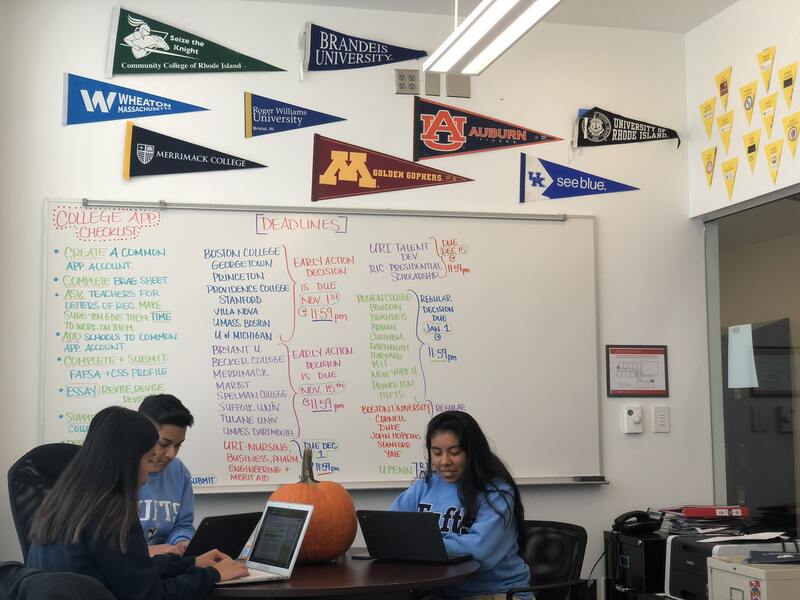 Over the next few weeks, we will introduce you to three unique – yet equally remarkable – members of the college class of 2023 as they embark on their own journeys, navigating through the demands of senior year while applying to colleges and universities across the country. First up: Mariela Cadena Hernandez, a future first-generation college student and an aspiring medical doctor – a pediatrician, to be specific – hailing from Central Falls. 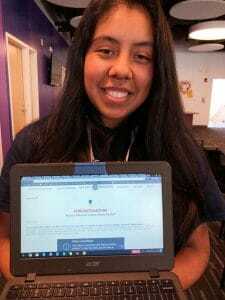 Mariela is a finalist in the QuestBridge National College Match, a highly competitive college and scholarship application process that helps academically outstanding seniors, like Mariela, gain admission and full four-year scholarships to some of the nation’s most selective colleges. QuestBridge provided Mariela with the opportunity to apply “early decision” to 12 renowned schools – Amherst College, Bowdoin College, Brown University, Dartmouth College, Massachusetts Institute of Technology, Princeton University, Swarthmore College, Tufts University, University of Pennsylvania, Wesleyan University, and Yale University – in the hope of “matching” with one to call home for the next four years. BVP: How did you choose the schools to which you applied? MCH: At first I didn’t want to apply early to that many schools since I wasn’t completely sold on many of them. But, with help from the College & Career team – Mr. Jose, Ms. Gemma, and Ms. Arango – along with (former BVP teacher) Mr. Sinha who is currently in medical school, I was able to come up with a list that I was happy with and felt sure about. I never had a dream school; I just want a good school that will allow me to explore my interests. BVP: Congratulations on being a QuestBridge finalist! That’s a tremendous accomplishment. How was the process of applying to QuestBridge? MCH: The QuestBridge process has been stressful, challenging, and long. As a junior I applied to be a College Prep Scholar with the help of Mr. Sinha. Becoming a College Prep Scholar led me to applying to be a National College Match Finalist. You don’t have to be a College Prep Scholar to become a finalist; it just gives you a head start on the application, and they also give you feedback on your essays. To become a QuestBridge finalist, you have to fill out a long application that includes information on your family, income, and academics, along with essays and short responses. Once I found out that I was a finalist, I had to complete each individual school’s requirements, including the CSS profile, FAFSA, interviews, extra supplements, and questionnaires – all by November 1. BVP: What will the month of December look like for you? MCH: On December 3, I will will know whether or not I have matched with any of the schools that I have requested. If I match, I know which college I will be attending! All matches are binding with the exception of MIT, Princeton, and Yale. However, if I don’t match, I will be pushed through to regular decision for those same schools. I will also continue applying to other schools through the common app. I have been coming up with a list of other colleges that I want to apply to if I don’t match, such as Boston College and the College of the Holy Cross. BVP: All that on top of your current course load! What are you currently taking? MCH: I’m taking four Advanced Placement (AP) classes, AP Literature, AP Government, AP Statistics, and AP Calculus, Anatomy and Sociology, as well as a college course the second half of the year. I enrolled myself in the Emergency Medical Technician Program at Roger Williams’ School of Continuing Studies. BVP: How do you feel BVP is preparing you for college and the world beyond? BVP: Have you been given any advice throughout this process that has really resonated with you? MCH: The most important advice that I have received has been to take advantage of all the available resources and to take risks. There are so many programs that help students, but students don’t apply because they don’t think they will get in. You never know until you try. BVP: Is there anything else you think we should know? MCH: I just want to thank Mr. Jose, Ms. Gemma, Ms. Arango, and Mr. Sinha for helping me throughout this process. I wouldn’t have been able to do any of this without their help. They have put up with so much, including my long QuestBridge application.